Blogger, Julie Van Rosendaal of dinnerwithjulie.com shares a recipe. Rinse and drain crabmeat well; remove any cartilage. In a large bowl, gently mix together the crab, bread crumbs, one egg, red pepper, mayonnaise, mustard, and salt and pepper to taste. Form into 8 patties, adding a little extra mayo if needed to help the mixture hold together. Place a small amount of flour in a shallow dish and season with salt and pepper. Put the second egg into another shallow dish and mix with a fork. Put the Panko in a third shallow dish. Dredge patties in flour. For extra crispy crab cakes, dip them in beaten egg to coat, then dredge in Panko or breadcrumbs. Cook patties 5 minutes per side or until golden brown. Meanwhile, pour water and lemon juice over the bread cubes; let stand for 5 minutes until the bread absorbs all the liquid and becomes mushy. In a blender or food processor, mix the soaked bread until it turns into a paste. While processor is running drizzle in warm melted butter; process until mixture thickens slightly. Taste and add salt if necessary. Add basil leaves and pulse a few times until the basil is chopped and incorporated. 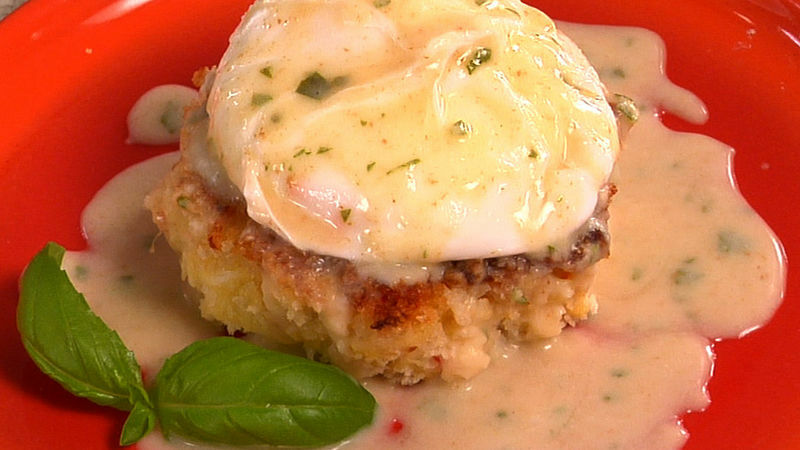 Serve poached eggs on top of the crab cakes, lightly drizzled with hollandaise sauce. Served over crispy crab cakes instead of English muffins, these have less than half the fat of traditional eggs Benedict. For a gluten-free version, use a potato for the patties and dredge them in rice or pea flour, omitting the breadcrumbs. - If using fresh/frozen crab, I recommend rinsing crab to remove “fishy” flavor. - Canned crab can be used also; I recommend lump crab vs. shredded crab for better flavor and texture. - Crab cakes are to be a nice golden brown on both sides – cakes have a wonderful crab flavor; additional ingredients compliment the crab flavor. - The hollandaise sauce is fresh flavored – compliments the egg and crab cake wonderfully; NOTE: sauce is thinner than traditional hollandaise sauce.